NEW DELHI, India, June 5, 2011 (ENS) – India for the first time this year served as global host of the United Nations’ World Environment Day June 5, marking the occasion with a week-long series of events across the country – walkathons, treeplanting and a green marketplace, films and art, and a seminar honoring the role of women in environmental protection. The events all had a forest theme in keeping with this International Year of Forests. India’s Environment and Forests Minister Shri Jairam Ramesh chaired a one day seminar on “Nature and Livelihood: Women’s Perspective” in New Delhi. He sadi, “Conservation of forests is crucial for sustainable development and green economy of the country,” and added that women are “crucial” for forest conservation. About 100 women from civil society organizations across the country shared their attempts to protect forests during interactive sessions with eminent environmentalists and grassroots leaders. UNEP Executive Director Achim Steiner and UN Resident Co-ordinator for India Patrice Couer Bizot highlighted the environmental concerns in the global perspective and praised the initiatives of women leaders at grassroots level in India in environmental awareness and forest conservation. 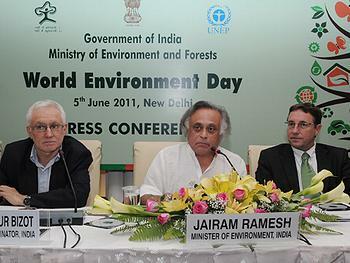 Steiner released the UNEP report, “Forests in a Green Economy: A Synthesis,” at a news conference with Ramesh in New Delhi. Investing an additional $40 billion in the forestry sector each year could halve deforestation, create millions of new jobs and help tackle the devastating effects of climate change, the report finds. The number of trees planted could rise by 140 percent by 2050 and as many as 30 million new jobs could be created by that same year. Steiner said forestry is one of the key sectors capable of helping the world transition to a ‘green economy’ model that is resource-efficient and low in its use of carbon. Minister Ramesh announced the establishment of the Gaura Devi Award to recognize the initiatives of Gaura Devi, a village woman who started the treehugger, or Chipko, movement in 1974 by gathering several dozen women to hug the trees in her village to protect them from being felled. The Gaura Devi Award will carry a citation and cash prize of Rs 2 lakhs (US$4,470). A green market, or Green Haat, in New Delhi attracted more than 50 exhibitors, showcasing the initiatives of forest dwellers, minority forest produce federations, women’s self-help groups, and NGO partners. Ramesh declared that this green marketplace will now be a regular event. A biodiversity film festival was organized in partnership with the Centre for Media Studies in New Delhi. From June 1-4, the festival screened more than 20 films on biodiversity from eminent national and international film makers. To create awareness among children, a painting competition took place today at Delhi Zoo. 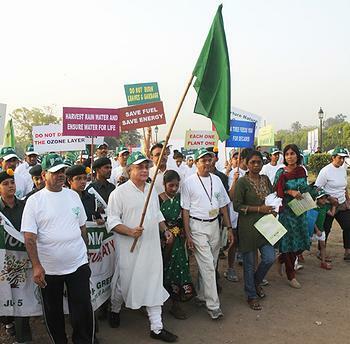 Ramesh administered a pledge for “saving our environment” and waved a flag to start a Green Walkathon from India Gate, New Delhi with about 1,000 participants from all sections of the society. In the southern city of Bangalore, another green marathon was flagged off in the morning. A workshop on Emerging issues in Wildlife Conservation was organized by the Wildlife Institute of India at the northern city of Dehradun. An exhibition on Mumbai’s environment, in partnership with Bombay Natural History Society, highlighted the environmental issues of metropolitan and coastal cities at Chhatrapati Shivaji and Churchgate Stations this week. In Pakistan, the day passed quietly with few aware of its significance. In Dubai, about 150 ghaf trees were planted in Mushrif Park Sunday to mark World Environment Day 2011 by Dubai Municipality, in cooperation with the Environmental Centre for Arab Towns and Panasonic Middle East. Models presented garments recycled from old clothes during a fashion show for World Environment Day in Seoul, South Korea on June 1. Elsewhere around the world BirdLife International launched a new section of its website to highlight the organization’s new initiative, BirdLife’s Forests of Hope. The program aims to prevent deforestation or promote restoration of natural forest at up to 20 sites covering at least five million hectares of tropical forest by 2015.